The design incorporates deep overhangs (the roofing material is metal) to protect outdoor spaces during rainstorms. The front of the Canadian home has a large courtyard for additional parking. “My wife is a tree hugger,” jokes Don Chan. He and his wife, Vivienne, purchased a plot of land in Tofino on Vancouver Island’s Pacific side to build a getaway cottage. Adjacent to the beach, the site nestles into an old-growth rain forest with many ancient cedar trees — some measuring 10 feet in diameter. Treading lightly on the site was a high priority for the couple when it was time to actually build. 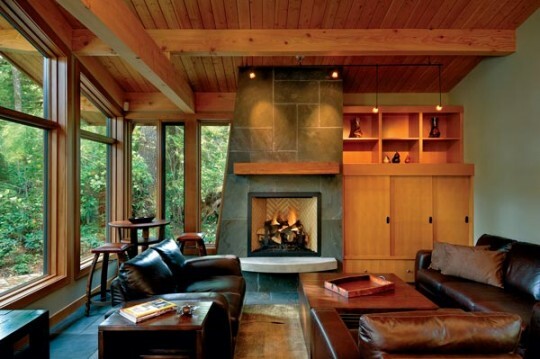 This contemporary-but-cozy home embraces the rain forest outside and serves as a staging area for family surfers, because it is near the “surf capital of Canada.” Bluestone is used as the fireplace material. 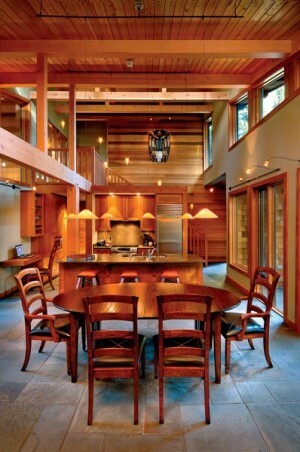 A simple Douglas fir mantel mimics the structural beams. “We wanted to leave as many old trees as possible,” says Don, who hired the architectural firm Helliwell + Smith Blue Sky Architecture to design the house. The firm, noted for its ecological consciousness and organic modernism, is also known for its hybrid Arts and Crafts style. The back of the Canadian house curves to accommodate an ancient cedar tree that is 10 feet in diameter. 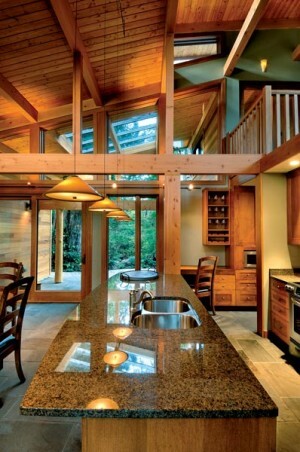 “We were drawn to more contemporary timber-frame designs,” says Don. The architects, in Don’s words, “nailed it.” The house blends perfectly with its woodland setting. “Tofino is a beautiful part of the world,” notes Don. “We wanted a place where our children and grandchildren would want to come back to over and over.” Tofino is not only known for its mixed growth forest, but it is also called the surf capital of Canada. “It is a place where the sea meets rain forest,” says Don. “Our extended family enjoys surfing, kayaking, beachcombing, and biking, and the house accommodates active guests nicely.” The greatest challenge in the house design was working with the large cedars on the property. The wall of horizontal cedar boards echos the cedar courses on the exterior of the house. “Instead of taking down trees, we designed around them,” says Kim Smith, principal of Helliwell + Smith. 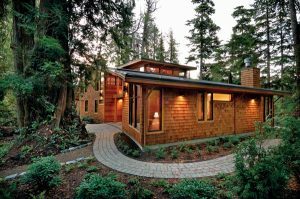 The 2,400-square-foot house literally embraces an old cedar with a 10-foot diameter by curving around the tree. “By accommodating the natural environment, the house really takes on a modern organic form,” Smith says. Although one north-facing exterior wall is curved, it is essentially a simple design — a one-and-a-half story, shed-roof, timber-frame structure with a shed dormer. “The shed roof reaches up to the tree canopy,” Smith says. The house is an extension of its environment in both form and materials. “Clad in cedar shingles and cedar siding, the building reflects the materials found in nature,” notes builder Troy Freeborn of Coastal Construction. “Cedar has natural resins that are rot resistant.” It’s the perfect material for this area, which can get more than 125 inches of rainfall annually. 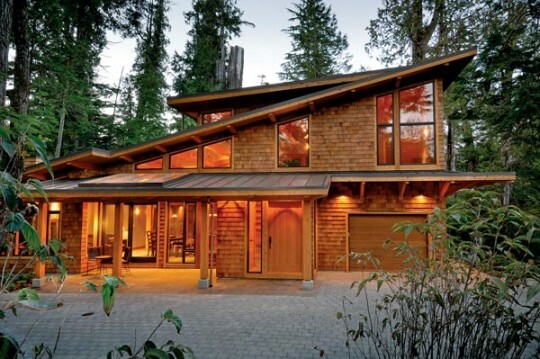 Coastal Construction worked with Canadian Timberframes, which designed the timber framing off site. “It was like putting a puzzle together once the timber arrived,” says Freeborn. “The walls went up first and the timber frame had to fit perfectly within those walls. There was a lot of back and forth between the timber framers and the builders to get the dimensions perfect.” And they did. The framing fit into the wall like fingers in a glove. The kitchen is compact. A center island topped with a granite countertop separates the kitchen and dining area. Cabinetry is made of maple. The couple wanted there to be transparency between the interiors and exteriors. A wall of sliding-glass doors opens the house to the woodlands, while two sets of skylights on the north and south sides of the house open outdoor rooms to the forest canopy. Because this is a wet environment, Helliwell + Smith designed covered outdoor spaces to protect the family from the rain. To further the connection between the inside and outside, the design team included clerestory windows on the southern side of the house. Another must in the design scheme was to have an open floor plan so guests could feel connected to one another. The kitchen flows into the dining and living spaces. For continuity in the design, the same materials are used throughout the public spaces. Pennsylvania bluestone floors are found on the interiors as well as the terraces. The fireplace is also Pennsylvania bluestone. 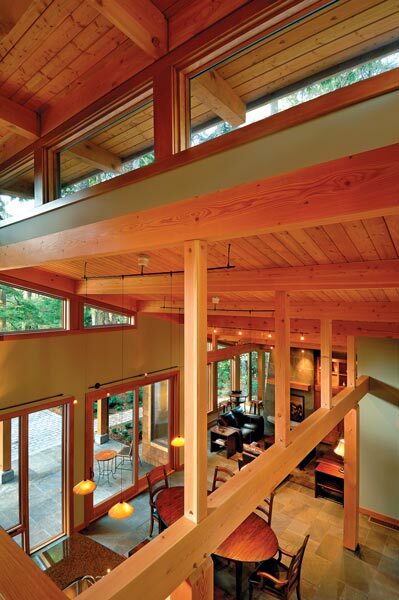 Canadian Timberframes used Douglas fir for the home’s timber structure, while some interior walls were finished in red cedar boards to reflect the home’s exterior materials. The rooms are kept clean and simple with built-in maple cabinetry. Just off the living room is the master bedroom. On the opposite side of the house, a staircase leads to two bedrooms and a playroom for the grandchildren.